Breitbart has a seething article attacking Paul Ryan for not being supportive enough of Donald Trump's presidential bid. Most of the sniping it about Ryan not supporting The Donald's xenophobic, bigoted world view and immigration policy, for loving global economics and for not being dismissive of the Toupeed One's sexual predatory audio tape. Yet these attempts to seemingly sabotage Trump are hardly a recent development from Ryan. Over the last several months, the Speaker has made a habit of both of overtly and subtly undermining his party’s nominee. Just prior to Trump’s cinching the Republican nomination, Ryan indicated to Capitol Hill reporters that he disavowed Trump’s campaign pledge to enforce U.S. immigration law. Ryan also made clear that he would not include Trump’s signature policy platforms on trade or immigration in the House GOP 2017 policy agenda. A recent report by The Atlantic spotlighted how Ryan, to this day, continues to oppose Trump on a wide range of issues from entitlements to infrastructure, to trade, to foreign alliances, to immigration, and to crime. After Trump won his party’s nomination, Ryan dragged out his decision to endorse Trump for weeks—leaving voters with the distinct impression that Ryan does not consider the choice between Trump versus Clinton to be an easy one. After he finally issued his tepid endorsement of Trump, Ryan continued to be one of Trump’s most frequent public critics—making repeated declarations in high-profile media appearances that would seem to undermine the party’s presumptive nominee. Beyond simply what Ryan has said to seemingly undermine Trump, it’s also a matter of what Ryan has not said. For instance, Ryan has scarcely discussed the WikiLeaks revelations regarding Hillary Clinton or the pay-for-play tactics of the Clinton Foundation. 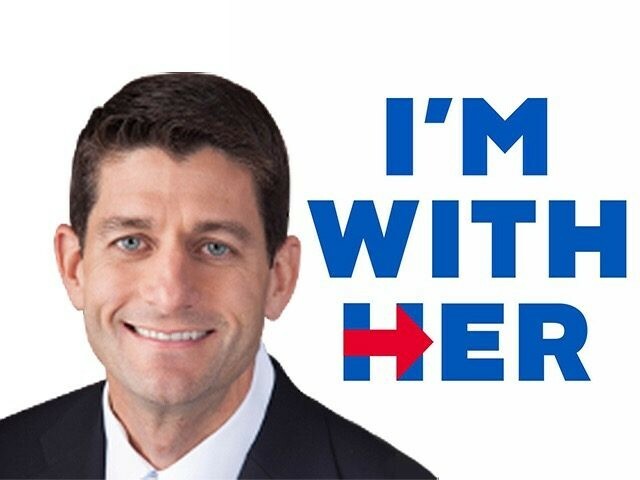 Nor has Ryan forcefully spoken out against Clinton’s declaration to Goldman Sachs that Americans who want to limit immigration are “fundamentally un-American”—an astonishing statement given the fact that according to Pew polling data, 83% of the American electorate would like to see immigration levels frozen or reduced. Instead, Ryan has seemed much more aggressive in attacking Trump during interviews about the election than he has been in going after Hillary Clinton. In fact, Ryan has frequently given fuel to many of the corporate media’s narratives against Trump—by not only refusing to defend his party’s nominee against his critics, but also by subsequently joining in on the left’s pile on of Trump after the nominee was forced to fight back against his critics himself. Aw, that just makes my liberal heart bleed for all of them. Another point of interest, although it's not clear if it is factual or just based on Breitbart's wet dreams, is that Ryan isn't long for the speaker's seat. I'd hope that he isn't long for Congress, but I'd take that as a start. Given that he easily fended off a Trumper in a primary I would not hold my breath. Once they start cleaning up the wreckage from Trump-zilla its my guess that Ryan will be seen as the great white hope.